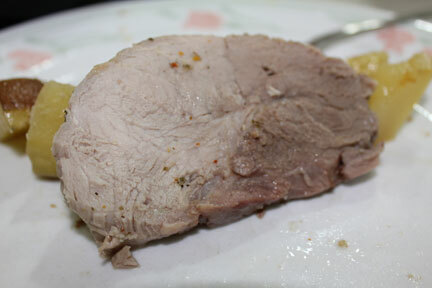 The other day I didn’t feel like cooking dinner (not an unusual state of circumstances at our house), so I popped a pork roast with potoates in the oven and a little more than an hour later, a delicious dinner was ready that took nearly no effort on my part. Exactly my kind of meal! 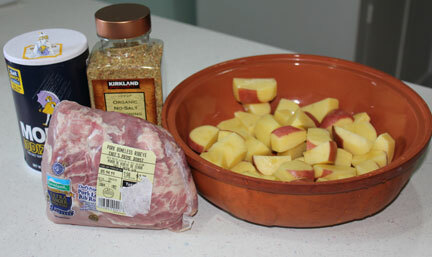 Ingredients for Pork Roast. I would normally include carrots, but I was out that day and didn't want to run to the store. 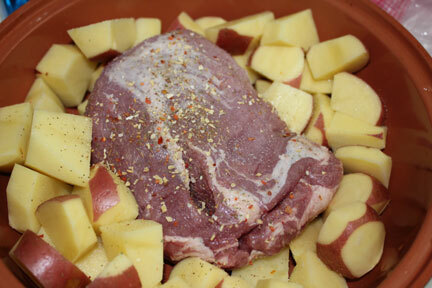 Pork and potatoes in my clay baker, ready to cook. Hot, juicy, tender and ready to eat. Depending on how many you are feeding, you may want a bigger or smaller roast. This recipe would serve 4. 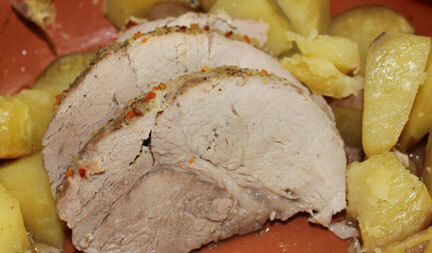 As for the type of Pork Roast you purchase, you can use a variety of different cuts. I had a boneless rib-eye roast for this recipe. I used my wonderful clay baker to make my roast because it steams the meat and makes it so juicy and tender. I posted a while back about clay bakers. If you don’t have one, you can also cook a roast in a regular roasting pan or even in a baking pan loosely tented with foil. I would normally add carrots to the potatoes (use reds and leave on the skin if you so desire. I desired.). You can also throw in celery, onions, garlic, whatever tickles your fancy. Bake for about an hour at 350 degrees or until a meat thermometer reaches the appropriate temp. Remove from oven, let rest with the lid on for 5-10 minutes then slice and enjoy!